Sean Gallup/Getty ImagesGerman newsweekly magazine Der Spiegel with cover headline of ‘Please don’t go!’ in reference to the upcoming referendum in Great Britain over whether to remain in the European Union. European leaders and media across the continent are trying to convince Brits to vote to remain in the 28-nation bloc on Thursday. Brits go to the polls on June 23 for a historic referendum on whether to remain or leave the European Union. 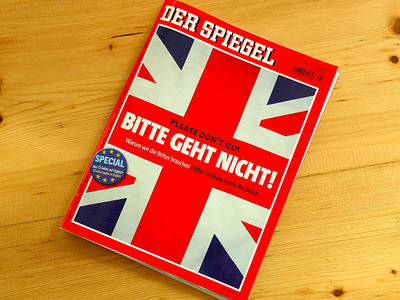 German weekly Der Spiegel and Swedish business daily Dagens Industri are among the European publications that have run front pages urging Brits to remain in the European Union ahead of the vote. European Council President Donald Tusk has also warned that a Brexit — a British exit from the European Union — could be “the start of the process of destruction of not only the EU but also of the Western political civilisation” in an interview with German daily Bild reprinted by Business Insider. Brits go to the polls on Thursday for the historic vote on EU membership. The latest polls show the vote is swaying towards Remain, with a poll for the Daily Telegraph giving the “In” vote a 7 point lead.